Nearly every building has an electrical component of some kind. While some tasks such as replacing an outlet or light fixture can be carried out by homeowners, other tasks must be performed by a registered and qualified electrician. Electrical work can be carried out on in all types of domestic, commercial and industrial buildings, as well as indoors and outdoors. Electricians design and install electrical systems, internal lighting and external lighting. They are also tasked with testing and repairing electrical and lighting systems. An electrician may also work with telephone, fire detection and alarm, emergency lighting, data-network and security systems. Electricians can also be hired to repair and maintain machinery with electrical motors and transformers, as well as build and install control panels that are used to operate electrical systems. All electrical work must follow safety standards outlined in the British Standards Institute (BSI) Wiring Regulations, or BS 7671. These rules are designed to prevent faulty installations that can result in death, injury and fire. Electrical work in England and Wales must also follow rules set out in the Building Regulations. The Building Regulations outline criteria and requirements to ensure all electrical work is safe, with Part P specifically applying to electrical safety in homes, gardens and outbuildings. Under the Building Regulations, electricians must ensure people are protected from fire or injury when designing, installing, inspecting and testing electrical installations. Installers must also be certified with an approved scheme. In Scotland, requirements for electrical work are outlined in the Building Standards. Standard 4.5 deals with electrical safety for all buildings, while Standard 4.6 sets out requirements for electrical fixtures in domestic buildings. Requirements are similar to those found in England and Wales, although self-certification schemes are not recognised in Scotland. In Northern Ireland, the Building Regulations (Northern Ireland) 2000 and the Department of Finance and Personnel's Technical Booklet E:2005 outlines requirements similar to those found elsewhere in the UK. Local Authority Building Control must be notified when certain electrical work is carried out in order to perform an inspection. Work can also be inspected and certified by an approved inspector, which may include an electrician that is certified by a competent person scheme through the NICEIC, ELECSA and similar bodies. Certain minor works do not have to be certified or completed by a registered electrician, such as replacing an electrical fitting, including socket outlets, light fixtures and control switches. 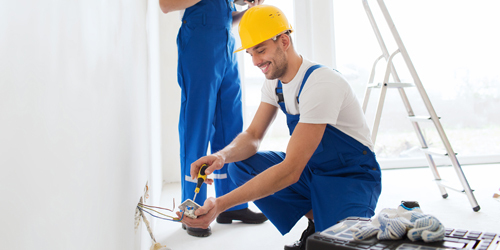 When choosing an electrician, it is important to hire one that is insured. An experienced and qualified electrician will have public liability insurance that covers their work in case something goes wrong. Not having insurance can put you at significant risk. When looking at a potential electrician, ask for evidence of public liability insurance. It is also a good idea to choose an electrician that offers a guarantee for their work, which demonstrates that they are committed to performance standards. Hiring a qualified electrician gives you the peace of mind that any electrical work will be carried out safely and up to all applicable standards and regulations. Look to see if the electrician is registered with the NICEIC, a voluntary regulatory body for the electrical contracting industry with more than 26,000 registered members. An electrician may also be certified through ELECSA, the British Standards Institution or the National Association for Professional Inspectors & Testers. In addition to being qualified and insured, a good electrician is experienced. Use an established contractor and consider recommendations from friends and family. When selecting an electrician, look into their background and ask for information about previous work. Reliable and honest electricians will have no problem with providing this information to you. They will also respect your concerns and not hassle you about your request for details about their experience. You should also look at online reviews or speak to previous customers to assess their service and work quality.